The standard version of the CLA 45 AMG, which has been available since June 2013, has the perfect genes for a competitive customer sports racing car: As the world’s most powerful four-cylinder engine in series production, the turbocharged AMG 2.0-litre unit generates 265 kW (360 hp) and maximum torque of 450 newton metres. As on the standard model, power on the racing version is transferred by the AMG SPEEDSHIFT DCT 7-speed sports transmission. 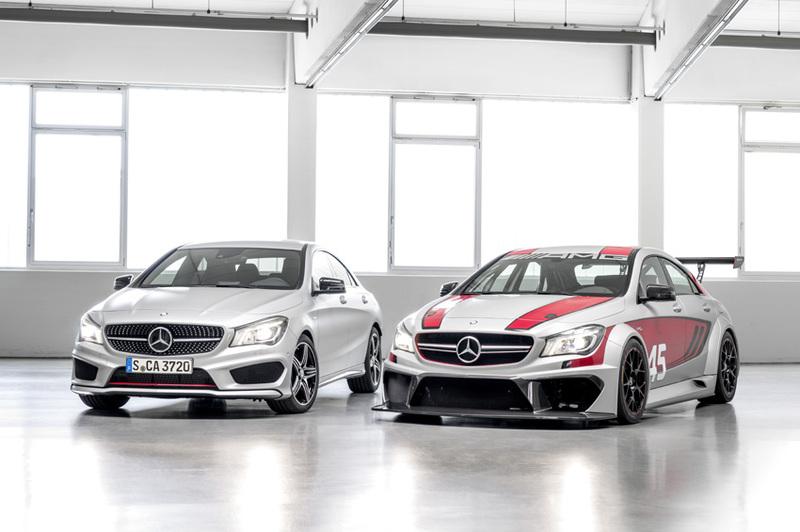 Given sufficient demand, the near-series CLA 45 AMG Racing Series could enter various international race series such as national brand-specific trophies or the German VLN series (Veranstaltergemeinschaft Langstreckenmeisterschaft Nürburgring – Organiser’s association for Nürburgring long-distance championships). The technical specifications will vary according to the race rules and race series. The engine output and power transmission are variable, with permanent all-wheel drive or purely front-wheel drive possible as in the standard version. Typical racing car features made completely from carbon-fibre (CFRP) make the extravagant design of the standard CLA 45 AMG even more spectacular: they include a new front and rear apron, flared wings and side sill panels. In addition, treadless racing tyres ensure an impressive width. Thanks to carbon-fibre rear wings and large cooling apertures for engine and brake cooling, the CLA 45 AMG Racing Series makes an imposing impression even when stationary. For use on the racetrack, the already good aerodynamic attributes of the four-door high-performance coupé are further optimised by the newly developed carbon-fibre components: the front apron with a front splitter ensures additional downforce, as do the rear diffuser with three fins and the adjustable rear aerofoil. The air intake in the side sill panels ahead of the rear wheels ensures effective cooling of the rear brakes. Wheel arch vents in the wings, which are flared by over six centimetres on each side, increase the downforce at the front and rear axles. In true racing style, the bonnet and boot lid are fitted with quick-release catches. In short: the motor racing DNA of AMG, the performance brand within Mercedes-Benz, is immediately recognisable in the CLA 45 AMG Racing Series. Like the SLS AMG GT3 before it, the CLA 45 AMG Racing Series was developed by Mercedes-AMG in close cooperation with HWA AG. HWA is responsible for the development and race appearances of the AMG-Mercedes DTM cars on behalf of and in close collaboration with Mercedes-Benz Motorsports. Professional racing drivers including the AMG brand ambassador Bernd Schneider share the cockpit during the course of the test and development programme. The HWA team, which originated within AMG, is one of the most successful teams in international motorsports: Ten driver’s titles in the DTM and ITC, as well as two overall victories in the FIA GT Championship, are compelling evidence. No other brand has won as many DTM races and DTM titles as cars from AMG-Mercedes.